Michael Weatherburn is a PhD student at Imperial College London and a Byrne Bussey Marconi fellow at Oxford University, as well as an active New Researcher. On 12 June 2014, he will be delivering a VAHS seminar at the Institute of Historical Research in London which will examine Seebohm Rowntree and the work experiments at the interwar Cocoa Works at York (see here for more information about the event). In this blog post, Michael provides a preview of his upcoming seminar. Seebohm Rowntree (1871-1954). Photo courtesy of the Rowntree Society. Seebohm Rowntree and his Cocoa Works at York remain iconic in the history of twentieth- century British manufacturing. In my talk about the plant, I shall firstly embed the Haxby Road Cocoa Works in Rowntree’s economic, moral, political and intellectual universe. 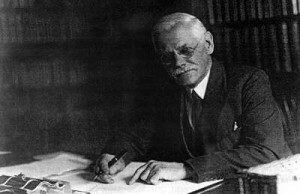 While much is known about Rowntree’s poverty studies of York, and some aspects of his York factory, what is not known is that his lifelong chemist’s passion for dynamic statistical data applied to his factory floor too1. For example, he extensively used payment-by-results (PbR) systems at the 8000-strong plant: the idea being that PbR encouraged harder individual work and simultaneously allowed managers to detect very precisely which workers were working best. In turn, this data also allowed Rowntree’s staff to fix output and wage levels to transcend the minimum figures which had been determined by factory budgets and social studies. This seminar will particularly explore Rowntree’s involvement with the public sector, in this case the Industrial Health Research Board, and their joint experiments in what methods could be used to inspire factory workers to work harder. We’ll examine how the joint experiments functioned and what they showed. We will highlight the contemporary comparisons made with the still-famous Hawthorne studies in the USA. In doing so, we’ll scrutinise the frequently overlooked, but entirely human-made and moveable, frontier between paid work and voluntary work. 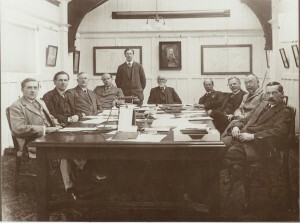 The Board of Rowntree’s before Seebohm’s tenure as Chairman. Seebohm is third from the right. Photo courtesy of the Rowntree Society. The Cocoa Works was actually so research-intense that one contemporary referred to it as a kind of ‘practical university’. In fact, the Cocoa Works was the first British plant to employ an industrial psychologist to study the emotional patterns and social behaviours of workers. But there was more taking place than this. 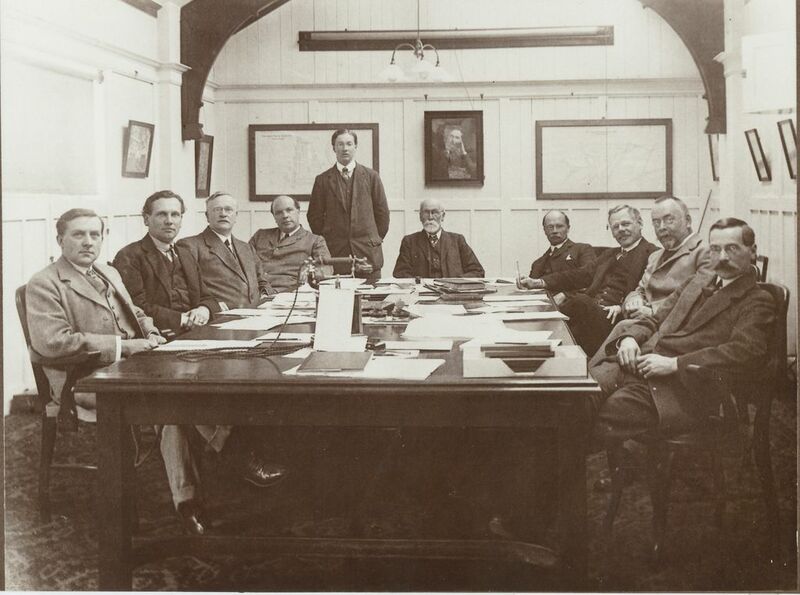 At my VAHS seminar, and also at my Byrne Bussey Marconi lecture in Oxford on 1o June, I will discuss the involvement of Rowntree and his staff with the intense study of employees’ work motions at the conveyor belt, work bench, loading bay and office desk. From a present day perspective, what difference does my study make? Firstly, PbR is very much on the political agenda: the government presently publishes rolling reports on PbR’s apparent effectiveness in the NHS. Yet we have few historical accounts of the origins of PbR and how it has developed to date. Secondly, the study examines a key British liberal business intellectual, highly influential to the postwar Labour government, who has never been examined as such. Thirdly, it helps to paint a picture of a more energetic and modernising British factory floor than our standard historical accounts evoke, or at least assume. Finally, my study of Rowntree forms one of several hitherto unexplored and thought-provoking historical case studies in my research which aims to be of interest to those examining work practices and workplace conditions in the public, private and charity sectors. 1. For Rowntree’s work on poverty in York, see B. Seebohm Rowntree, Poverty: A Study of Town Life (London: Macmillan, 1908). This entry was posted in Michael Weatherburn, New Researchers, Seminars and tagged business history, private sector, Rowntree. Bookmark the permalink.